Available for general use – Subject to agreement to our Terms & Conditions of use as shown at the base of this webpage. Itinerant Aircraft Landing Fee for Private Operations/Training – 1 fee per circuit session. Annual Facilities Fee for Resident Private Aircraft: $334.33 / year covers unlimited landings for a specific named aircraft and use of facilities, for aircraft that are based at the airport and used only for private operations. If a mix of private/commercial operations applies, discuss with Airport Manager. Permission to base an aircraft at West Auckland Airport requires agreement of the management. Public Service Organisations: Police, Ambulance, Fire, Rescue, Coastguard, Military and Angel Flight (if identified as such at time of landing): No charge. If not identified at the time of landing, 'Visiting' rates... retrospective credits are not available. Touch & Goes, Low Approach and Go Around: The first of a session of movements is charged at the Landing fee rate, subsequent movements in a continuous series of 'Touch and Go' or 'Go around' etc are no charge. These movements make use of the approach fan so depend on the airport's consents, and occupy a landing slot to the same extent as a full stop landing followed by an immediate takeoff. All movements must remain on the runway centre line and below 500ft along the whole length of the runway to ensure separation from parachutes which may cross the runway only above 1000ft. * Pursuant to CAA rule CAR 91.311(c) an aircraft is not permitted to fly below 500ft (outside of a designated Low Flying Area) except for the purpose of conducting a take-off or landing which may be balked or discontinued. Therefore, any such flight over WAAP is only made lawful by the availability of WAAP’s facilities and constitutes “Using the Airport”. Establishment: For new hangars only, a one off fee paid per hangar before construction begins. A full commercial lease with rights of renewal is provided, similar to those used for shops, factories and other commercial premises. Contact the Airport Manager, Simon Lockie Ph 09 420 8010 Email simon@WestAucklandAirport.co.nz. Percentage of Outgoings: Charged annually to cover a fixed percentage of Council rates and shared costs as per the lease document. · 15m x 14m & 12.5m x 14m 2% of total cost to airport. · Custom Hangar Sizes % to be assessed. Other Power/water/sewage connections are available and are costed individually depending on requirements. Payments to ‘Aerodrome IT Systems Ltd’ a/c 02 - 0100 – 0781123 – 000 quoting aircraft reg number (or other ID please). Interest charged at 2.5% / month on the overdue part of any accounts. All fees are subject to change, usually on 1st April in line with the CPI change for the previous calendar year. By entering the Airport you are agreeing to the latest Terms/Conditions/Fees as published on the website www.WestAucklandAirport.co.nz, which are subject to change without notice. These are to be read in conjunction with the Airport Landing Plate found in the AIP Vol 4. · The safety of yourself and all people you bring to West Auckland Airport Parakai (WAAP). · Ensuring that all aircraft, pilots and maintenance people have the appropriate CAA, OSH and other certifications and follow appropriate procedures. · You agree to indemnify us against any claims relating to WAAP activity of yourself, your aircraft, and anyone you bring to WAAP, even if caused by our negligence. · You agree to provide adequate public liability and third party insurance for your operations. Radio: 123.5 mhz. As the airport is in a MBZ, all aircraft must have a radio, or be accompanied by a radio ship that makes calls for both. Runway: 07 / 25 is 860m long, 740m x 8m of seal plus a 120m all-weather grass extension at the eastern end. In winter to avoid getting stuck, turn only at the turning bays. Circuit and Skydiving: All circuits to the north, 07 LH, 25 RH. To allow simultaneous aircraft and parachute operations, aircraft must join wide downwind, base or final (NOT overhead), stay below 500ft when over the runway, and climb straight out past the end of the runway before turning. Parachutes are not permitted to cross the runway below 1000ft (they have wrist altimeters). If you hear an aircraft intending to join overhead, tell them that there is frequent skydiving and that they should join downwind, base or final. Similarly if you hear someone intending to transit overhead, advise them to pass well clear. Wind direction is usually obvious from waves / toitoi, or ask the parachute jump ship for runway in use. Be aware that the jump ship might take land or takeoff downwind for its own operational reasons, but all aircraft (including rotorcraft) should fly a standard circuit according to the wind direction. Commercial operators have aircraft that are expensive to run and are often working to tight schedules. When possible please let them go first, whether at West Auckland or other Airports. Running Up: Do all the checks and run-ups clear of the runway, and enter the runway only when ready to roll immediately. Gyros may need to pause briefly on the threshold to spin up their rotors. Runway 07: Run-up on the taxiways, or at 'A' near the fuel pumps. Runway 25: Run-up at the holding points on Taxiway 'W' (or the northern part of taxiway 'B'), to avoid blocking the taxiway intersection. Do not enter the intersection or backtrack the runway until ready to roll immediately. Takeoff 07: Caution high ground to the east. Mandatory left turn on reaching the river. Remain on the East side of the river during crosswind climbout to maintain separation from parachutes. If going around, remain below 500ft and over the runway until past the end of the runway. Landing 25: Many pilots fly a gently curving turn from early right base 25 to late final so as to descend over low farmland rather than the higher forest. If going around, remain below 500ft and over the runway until past the end of the runway. Aircraft Based at the Airport: Aircraft may only remain at the airport for more than 30 days with ‘agreement to base’ from the Airport Management, which may be withheld. An Annual ‘Access Fee’ (which includes unlimited landings for named pilot(s) and aircraft) is to be paid for all resident based aircraft for which a Participation Levy is paid to the CAA. Non-payment of rent/fees for 30 days will result in restriction of use of the airport. Visiting Aircraft: Visitors should exit at ‘B’ and park on the hard areas near the hangars. In summer they should park on the grass. Aircraft parked overnight in the open may be changed a parking fee. A courtesy car is available for visiting aviators wanting to go into Parakai, Helensville towns (5 mins), Hibiscus Coast or Auckland city (35 mins)... no charge, so long as it is bought back with more petrol than when it was taken. Car Parking and Vehicles: Park in the carpark and do not take vehicles 'airside' unless there is a particular reason to do so: such as taking something heavy to the hangars or wanting to leave a car in a hangar overnight. Only holders of an aviation certificate (or someone authorised by the Airport management to drive airside) is to take a vehicle airside. The speed must be kept below 10 kph and flashing hazard lights used. The airside gate must be closed, even if the airside visit is intended to be for only a few minutes. Ground vehicles are not to go to closer to the runway than taxiway 'W' , except for airport maintenance, and emergency vehicles. Walking on the operational area: Access to the airside is restricted to holders of an 'aviation certificate'. If you take someone else airside, you are accepting full responsibility for their safety. Airside dangers may not be obvious to a non-aviator, so if leaving someone on the ground while taking another for a flight, have them wait in the Pilot Lounge which is close to the carpark, has good viewing, toilets and other facilities. Only cross Taxiway 'W' towards the runway when there is a good reason to do so, and wear a Hi-Viz jacket at all times in this area. Safety Committee: The committee is made up of members of each type of user of the airport. It meets as required to discuss incidents, complaints, and any matters of concern reported to it, and makes recommendations for changes when thought necessary. If you see a problem that has safety implications, take immediate steps to correct it if possible, and email the Safety Committee Secretary, Carreen Lockie, email: carreen@lockie.co.nz. Emergencies: Call 111, the Helensville Fire Service is based nearby and can attend quickly with specialised knowledge and equipment. For initial assistance, a ‘Rescue Bag’ with fire extinguisher and heavy cutters, gloves etc is kept in a waterproof box at the corner of Hangar #10, the Leading Edge Engineering hangar. Additional fire extinguishers are in that hangar, the Pilot Lounge, and other hangars. If heavy lifting is required the mower tractor has a front-end-loader and lifting chain. Incidents are to be reported to the CAA as soon as possible. If anyone has been injured, do not move the aircraft involved until CAA approve that, unless necessary for rescue. If the runway is blocked by an incident, advise aircraft in the air to divert to North Shore Airfields. Mayday Calls: If heard, write down everything starting with the location. Do not reply by radio beyond ‘Mayday acknowledged’. Unless you hear the situation resolved quickly, phone 111 and advise, “I am at West Auckland Airport Parakai and have heard a mayday call from an aircraft saying …… “. Relay the Mayday to anyone in the air so that they can investigate and they can advise the Air Traffic Control at NZAA or NZWP. Noise: Noise abatement procedures are mandatory, with propeller tips kept sub-sonic at all times except when required for flight safety. If doing repetitive flights vary the turning points and flight path. Noisy aircraft will need to fit extra sound reduction gear if quietness can't be achieved operationally. Gibbs Farm: This is an interesting property on the eastern side of the Kaipara Harbour about seven miles North of the Airport. The property has a collection of large art works. While it is interesting to view from the air, please be considerate of the Gibbs family and their exotic (and expensive) animals and avoid flying overhead the farm. If you want to admire the art works, fly past off to the side on low prop revs and make no more than one or two circuits. Booking Aircraft: Be considerate of other pilots by booking Waap aircraft for the time required only. E.g. if intending to start a briefing at 2pm, book the aircraft from 2:30 so someone does not cut their flight short only to see the aircraft sit on the ground for time that they would have used. The booking website, www.flybook.co.nz, is available at no charge for syndicates and flight training. Aircraft and Hangar Access: The Airport Management may enter hangars, and move aircraft in an emergency. When required they may give access to appropriate people for maintenance to aircraft or hangars. Commercial Operations: These require prior approval from the Airport Management. 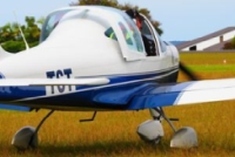 Flight training originating from the Airport is considered a commercial use. Hiring out of aircraft to someone other than a ‘Named Pilot’ on more than one day a month is considered commercial use. CPLs, ATPLs and Instructors should not hesitate to take command if they see an unsafe situation developing. West Auckland Airport: Manager: Ph 09 420 8010. 'Tweety', a Cessna 150 Aerobat after its restoration by Leading Edge.